8 August 1914: Entered the Army as a War Volunteer in the Braunschweigisches Infanterie-Regiment Nr.92. 15 September 1914: In the field with Reserve Infantry Regiment 208. 24 October 1914: Wounded/in hospital. 22 December 1914: Allocated to the Replacement Battalion of Reserve Infantry Regiment 208. 18 February 1915-14 April 1915: Detached to the Fahnenjunker Course in Döberitz. 13 April 1915: Named a Reserve Officer Aspirant. 21 April 1915: In the field with the Garde-Füsilier-Regiment. 5 June 1915: Sick/in hospital. 20 August 1915: Allocated to the II. Replacement Battalion of the Guard Fusilier Regiment. 20 August 1915: Transferred to the Replacement Depot of the XXXX Reserve Corps. 29 November 1915: In the field with Reserve Infantry Regiment 261. 1 October 1916: Leader of the 2nd Company of Reserve Infantry Regiment 261. 9 April 1917: Wounded/in hospital. 30 August 1917: Again, Leader of the 2nd Company of Reserve Infantry Regiment 261. 18 March 1918: While retaining his position in Reserve Infantry Regiment 261, named an Active Officer in the 5. 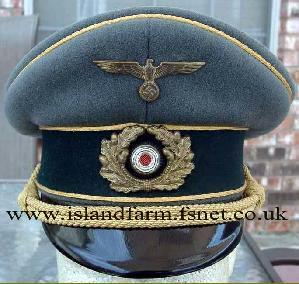 Hannoversches Infanterie-Regiment Nr.165. 30 April 1919: Transferred to Infantry Regiment 165. 19 August 1919: Transferred to Reichswehr Infantry Regiment 6 of Reichswehr-Brigade 3. 15 October 1919: Transferred to Reichswehr Infantry Regiment 103 of Reichswehr-Brigade 3. 14 May 1920: Transferred to Reichswehr Infantry Regiment 12 of Reichswehr-Brigade 6. 22 May 1920: Leader of the 7th Company of Reichswehr-Jäger-Regiment 31 of Reichswehr-Brigade 16. 5 November 1920: Transferred to Reichswehr Infantry Regiment 13 of Reichswehr-Brigade 7. 1 January 1921: Transferred to the 18th Infantry Regiment upon the formation of the new Reichsheer from the Übergangsheer or Transitional Army. 16 March 1925-8 April 1925: Detached to the Course for Light Machineguns in Munsterlager. 23 June 1925-19 November 1925: Detached for the training of Physical Education Instructors in Wünsdorf. 1 September 1927: Transferred to the 13th Company (Mortar) of the 18th Infantry Regiment. 4 April 1927-28 August 1927: Detached to the Officers’ Weapons Course in Dresden. 1 June 1928-20 September 1928: Detached to the 3rd (Prussian) Artillery Regiment. 1 October 1928: Detached for Leader Assistant training with the staff of the 2nd Division. 1 June 1929-25 September 1929: Detached to the 4th (Saxon) Signals Battalion. 1 October 1930: Transferred to the 2nd (Prussian) Infantry Regiment and detached to the 9th (Prussian) Infantry Regiment and to the Reich Archive, Potsdam. 1 October 1931: Transferred to the 15th Infantry Regiment. 1 December 1931: Chief of the 12th Company of the 15th Infantry Regiment. 6 October 1933-28 October 1933: Detached to the Transport and Equipment Course at the Hannover Transport Training Command. 1 October 1935: Commander of Machinegun Battalion 2. 19 December 1939: Operations Officer (Ia) and Infantry Advisor on the Reconnaissance Staff of the Commander-in-Chief East. 14 October 1942: Delegated with the leadership of the 126th Infantry Division on the Eastern Front. 1 December 1942: Commander of the 126th Infantry Division on the Eastern Front. 25 April 1943-14 July 1943: Delegated with the leadership of the 126th Infantry Division on the Eastern Front. 5 April 1945: Commander of the 278th Volksgrenadier Division in Italy. 2 May 1945-17 May 1948: Prisoner of war in British captivity. 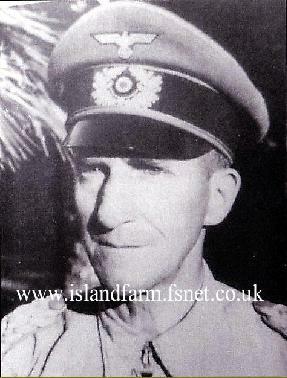 4 October 1946: Transferred to Island Farm Special Camp 11 from LDC (London District Cage). 12 May 1948: Transferred to Camp 186 for repatriation. 1953: Published the divisional history Die 278. Infanterie-Division in Italien, 1944-1945. 1967: In collaboration with Generalfeldmarschall a.D. Erich von Lewenski genannt von Manstein and Knight’s Cross holder Werner Buxa, published Die Deutsche Infanterie, 1939-1945, a photographic history of the German infantry at war. Harry Hoppe was nicknamed “Stan Laurel” by his comrades because of his facial resemblance to the English-born actor/comedian. 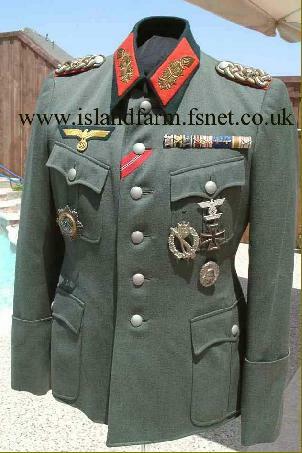 He was the commander of 278th Infantry Division in Italy; integrated into this unit was one of the few fascist Italian battalions of the RSI (Italian Social Republic, Mussolini's last “puppet government”) used by the German Wehrmacht in the front line. It was named “battaglione d'assalto Forlì” (assault battalion Forlì). It was composed by 500 fascists from Forlì, Mussolini's hometown, who defended the city. 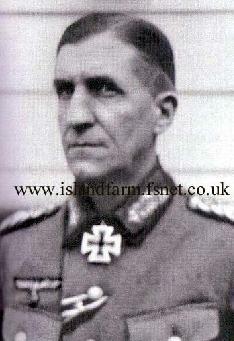 Knight’s Cross of the Iron Cross: 12 September 1941, Oberst, Commander of Infantry Regiment 424. Oakleaves (No. 682): 18 December 1944, Generalleutnant, Commander of the 278th Infantry Division. 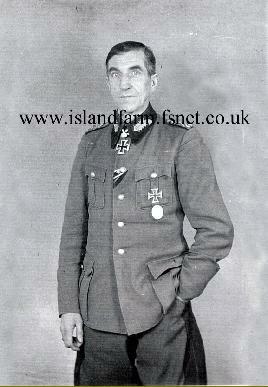 German Cross in Gold: 16 May 1942, Oberst, Commander of Infantry Regiment 424. Prussian Royal Hohenzollern House Order, Knight’s Cross with Swords: 17 April 1918. Prussian Iron Cross 1st Class (1914): 15 March 1917. Prussian Iron Cross 2nd Class (1914): 20 March 1916. 1939 Clasp to the Prussian Iron Cross, 1st Class: 12 July 1941. 1939 Clasp to the Prussian Iron Cross, 2nd Class: 26 September 1939. Mentioned in the Wehrmachtbericht [Armed Forces Communiqué]: 6 July 1944: In continuous and heavy defensive fighting, the 278th Infantry Division, commanded by Generalleutnant Hoppe, fought especially bravely against an overwhelming enemy and inflicted heavy casualties on him. All enemy breakthrough attempts [to capture Ancona] failed in the face of the division’s obstinacy. Bradley, Dermot. Die Generale des Heeres, 1921-1945, Band 6 (Hochbaum-Klutmann). Biblio Verlag, Bissendorf, Germany, 2002. Haupt, Werner. Army Group North: The Wehrmacht in Russia 1941-1945. Joseph G. Welsh, translator. Schiffer Publishing, Ltd., Atglen, Pennsylvania, 1997. Kurowski, Franz. Battleground Italy, 1943-1945: The German Armed Forces in the Battle for the “Boot”. Ian McMullen, translator. J.J. Fedorowicz Publishing, Winnipeg, Canada, 2003. Click here to see a photo of Generalleutnant Harry Hoppe in the company of fellow prisoners of war at Island Farm.